The works on next Rewolucje album has begun. Three stories scheduled to appear in this one needed some small upgrades. Two of them were cosmetic (translation and cleaning), but the third one needed a solid upgrade. As in – complete inking. 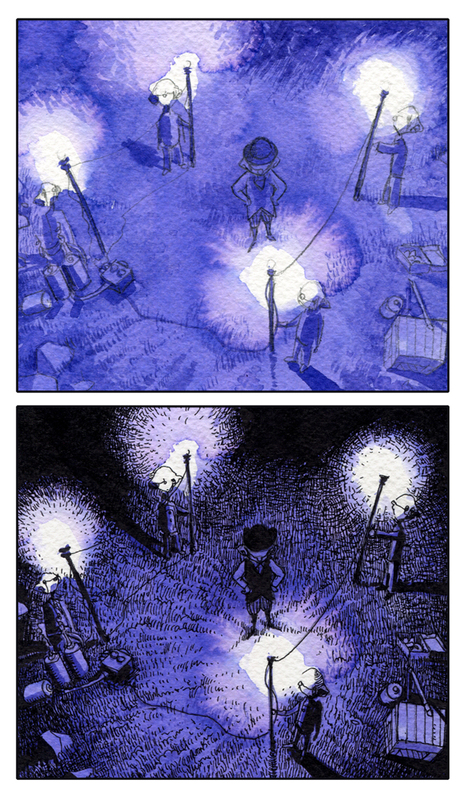 This is the story from the Cartoonia comic anthology, and it was all done in pencil and waterpaint. For the sake of the new album integrity this needed to be unified with the rest of the material, hence the redo. It took an entire weekend to properly ink all 20 pages. (March 22-24, 2013). Is such a speedy work any good? Well, here’s a small example of the outcome (compared to the original version for your convenience). You be the judge.